The finest sounding bells in the world. 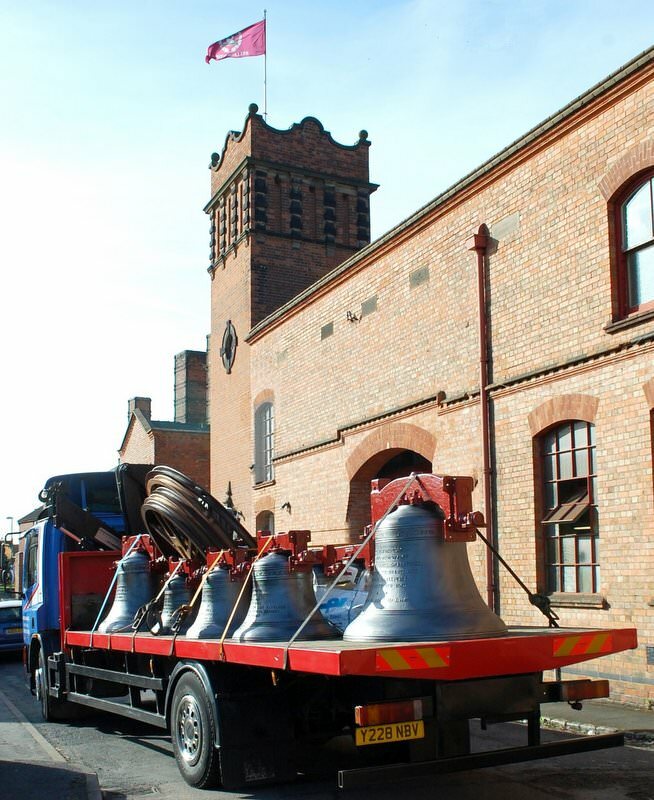 Peals of bells from our bell foundry ring out from towers all over the English speaking world. Many of the world’s most experienced change ringers regard them as the finest instruments of their kind ever to have been created. Beautiful sounding bells hung in immensely strong bell frames on perfectly balanced fittings for ease of handling. The number of complete Taylor change ringing peals now exceeds 625, and this total is greater than the combined output of all other bell founders. Christchurch Cathedral, New Zealand bells ready to leave Taylor's - April 2014. 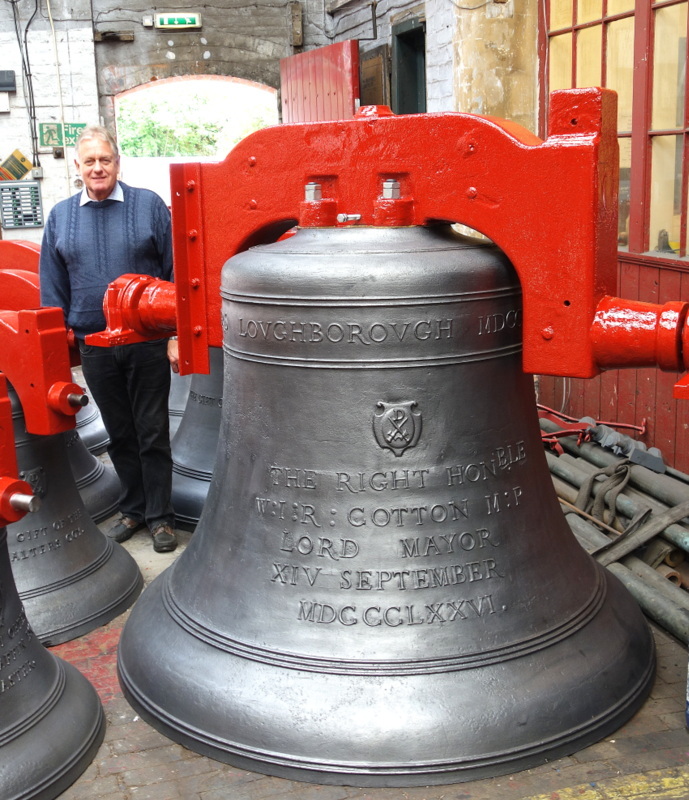 A new ring of ten bells for Guildford, Surrey leaves the Foundry April 2013. 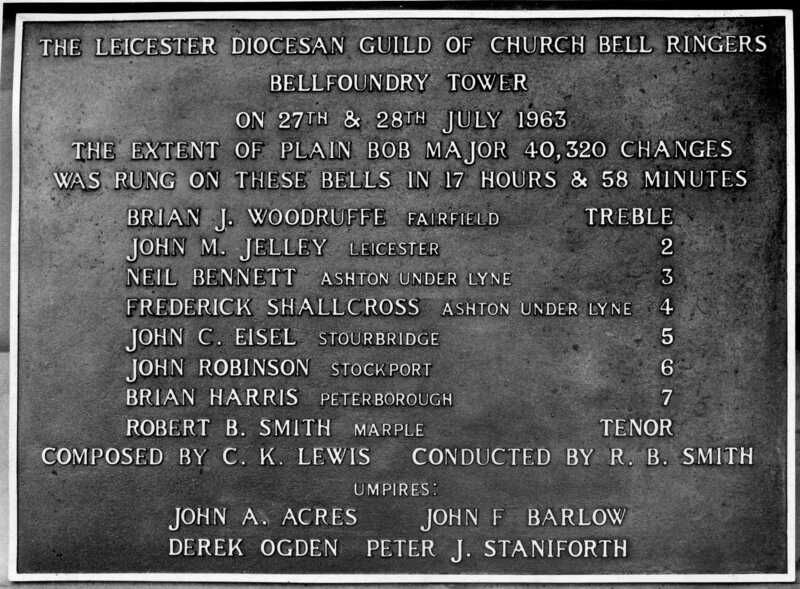 Cast plaque recording the longest ever peal which was rung on our bell foundry bells - a unique record in the history of change ringing. St Paul's Steeple Keeper, John White, with the tenor bell. St Paul's ring of twelve ready for dispatch. 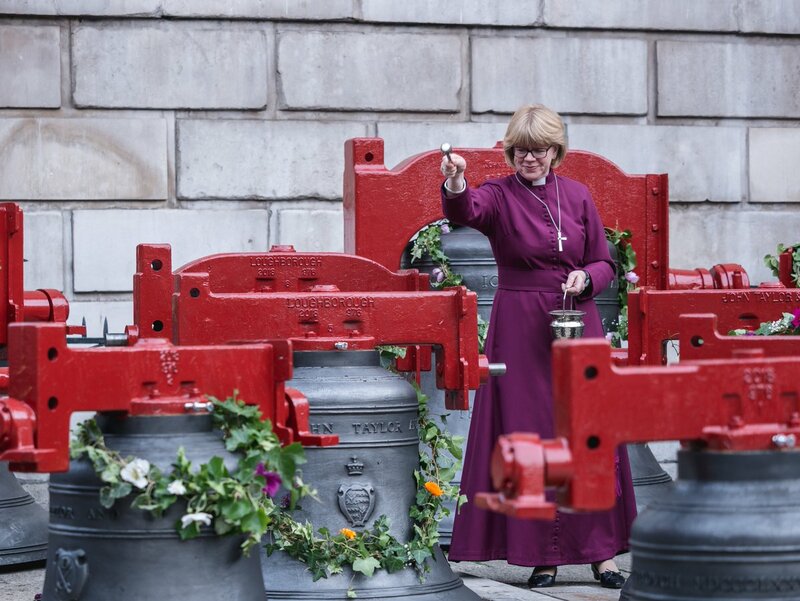 Lowering one of the bells down the West Front of St Paul's Cathedral. 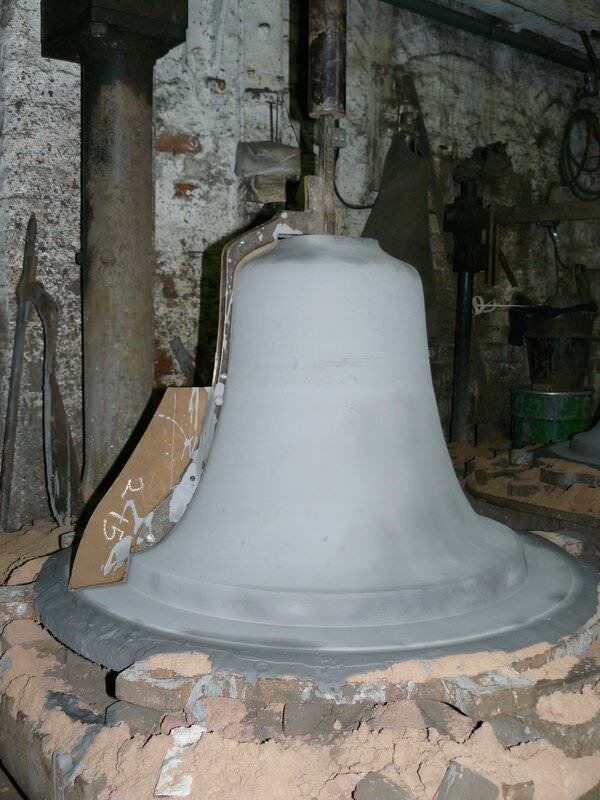 Whilst virtually all other bell founders now cast their bells using self-setting sand moulds, we still make our bell moulds from the more labour intensive loam process as bell founders have done for centuries past. The making of our moulds takes a considerable amount of time as each layer is dried in a kiln overnight before the next is added, with all inscriptions and decoration being pressed into the final layer of wet loam as the mould is completed. 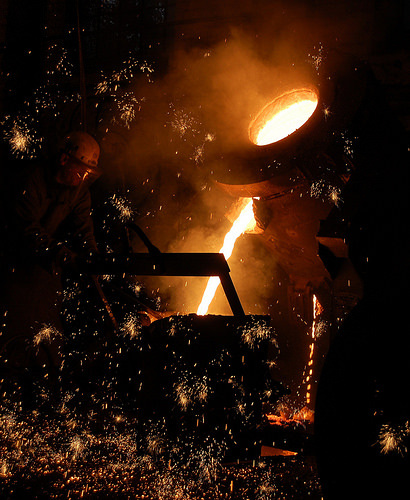 Although this is costly for us, the worlds finest bell experts assure us that the use of loam is a vital factor in producing the sweet toned bells for which our Foundry is known. Following traditional methods we also still dig a pit for each bell and bury our moulds in the earth of the foundry floor before casting. 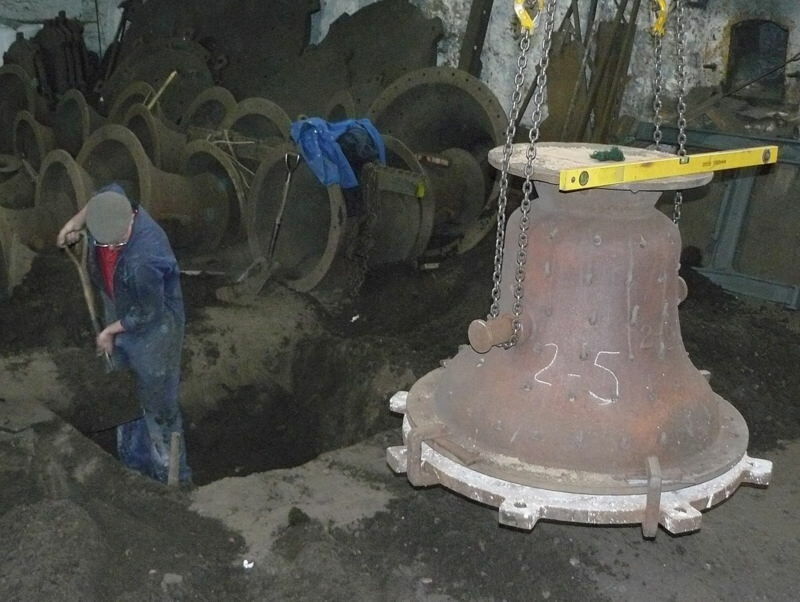 With the introduction of immensely strong cast iron bell cases in the 19th century, most bell founders abandoned the burying of their moulds to save time and money. At Taylors we are convinced that allowing the bell to cool slowly in the earth over a period of days gives a better molecular structure and a better sounding bell – and our discerning customers agree with us. Bell cases of all sizes stacked up waiting to be used. 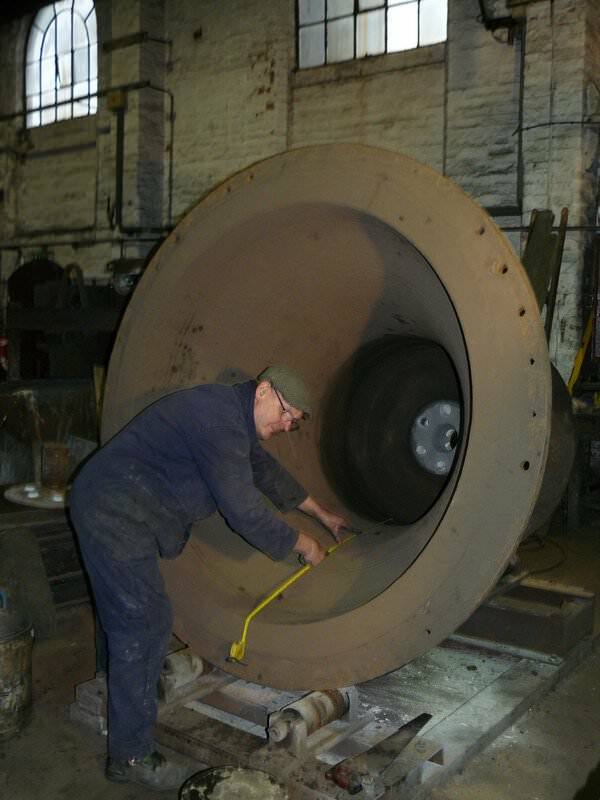 Our foundry master, Roger, prepares the outer mould for a 2 ton bell - this is also called the "cope". Roger Johns, our Head of Foundry digs a pit to bury a new bell mould prior to casting. An inner mould ready for casting - also called the "core". Getting ready to cast - metal pours from the furnace into a crucible. 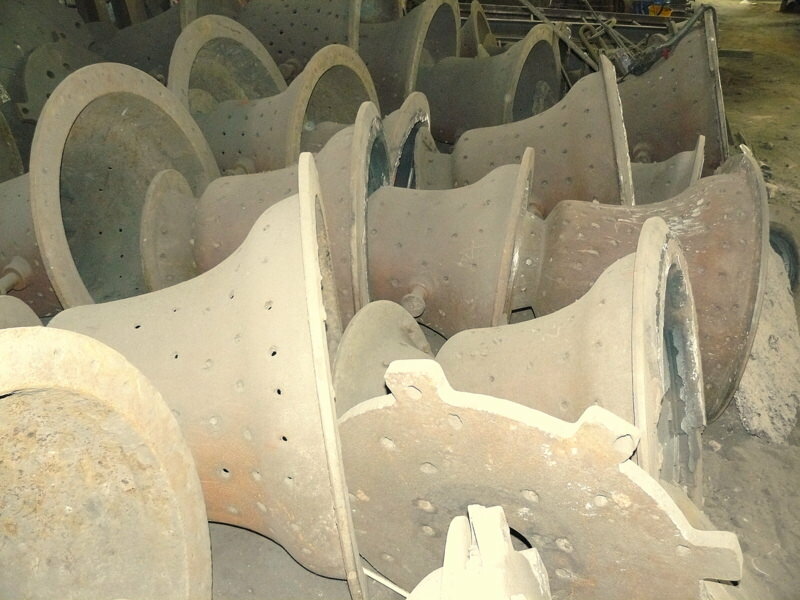 Newly cast bells after removal from their moulds and before final tuning and fettling. 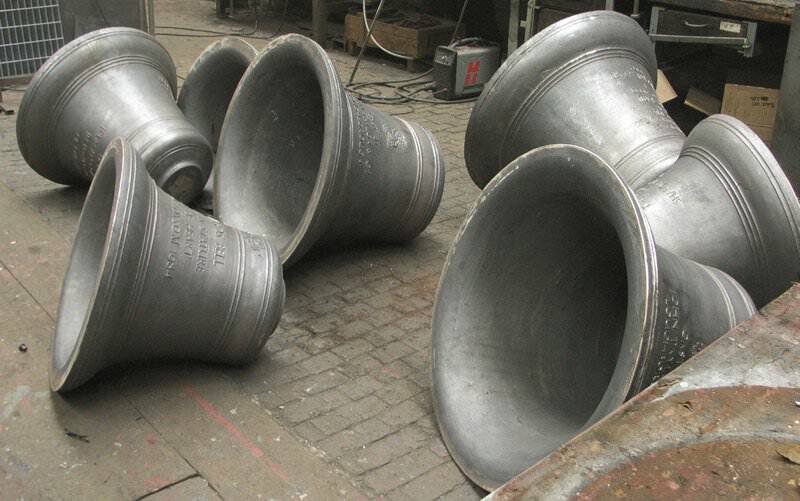 Taylor's Foundry is well known for having pioneered the five tone principle of bell tuning in 1896. This produces the purity and sweetness of tone which allows the bells to sound with rich and full mellowness. The Bell Tuner works on five principal harmonics known as the hum, fundamental, tierce, quint and nominal, and when the correct frequency is achieved for each of these, the bell is in tune with itself. These special tuning principles have been copied by other foundries around the world, but none have managed to match the full-bodied Taylor sound. 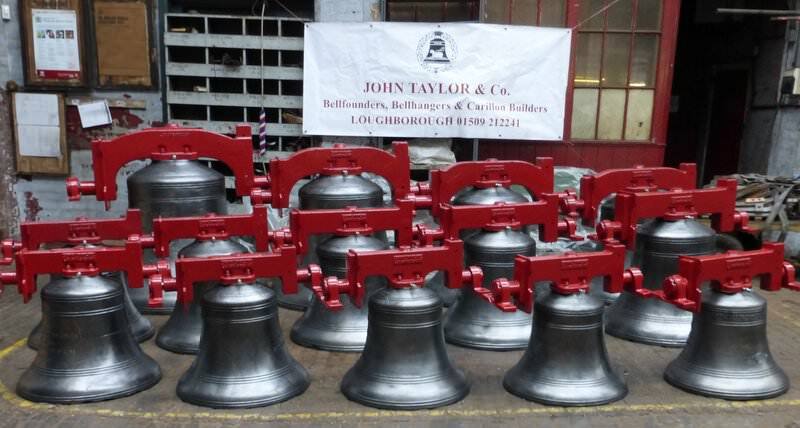 Whilst Taylors embraces good technological advancement, all of our bells are tuned by hand (not by a computerised numerical control lathe) to ensure each is marginally unique and therefore enjoyable to the human ear. Each newly cast bell can be inscribed and decorated with a lettering style and decorative band from our reasonably extensive existing portfolio. Customers can ask to see the various styles available and choose the ones they like best for new bells. They can also commission new art work to be cast in relief on the bell's external surface - this might include coats of arms or shields, or religious icons as appropriate. Delivering to the church - ours is a fully inclusive service. 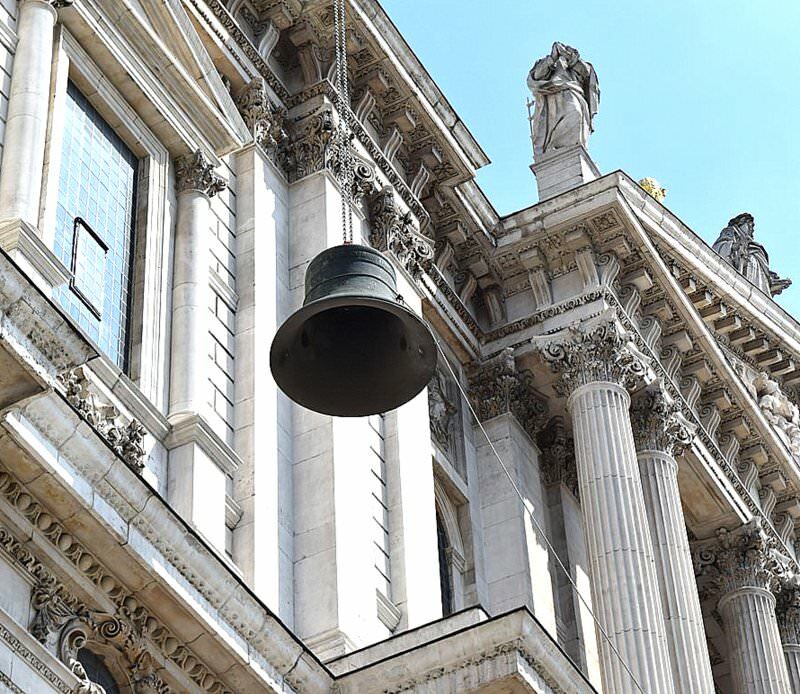 We design, manufacture and install bell frames made from treated hardwoods, cast iron and galvanised steel, or galvanised fabricated steel to meet customers’ requirements. 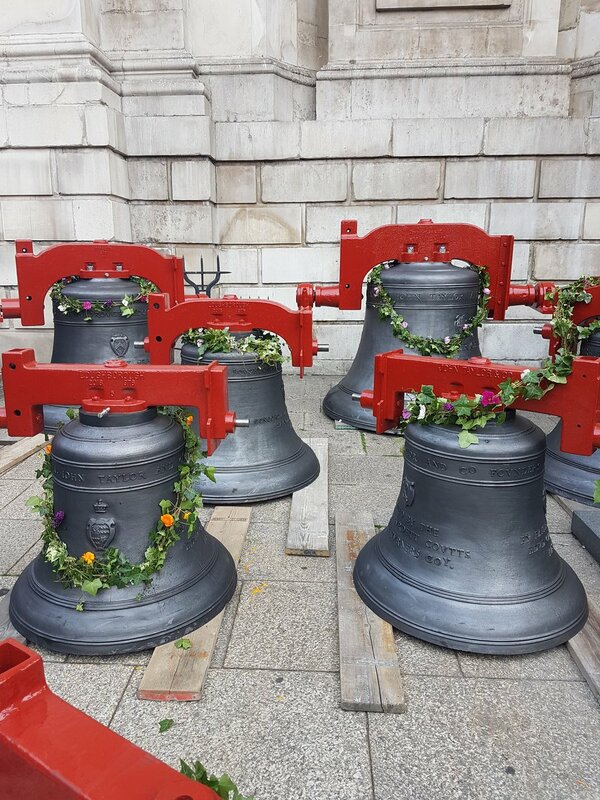 Our bell frame designs give straight rope drops from the roller boxes to ensure ease of bell handling for the ringers, and are very strong and rigid to ensure that a ringing peal of bells imposes the minimum forces on the tower in which it hangs. We are happy to work closely with any architects or structural engineers appointed by our customers. We also offer the service of providing detailed drawings and specifications to allow bell frames to be constructed locally if customers prefer to employ their own engineers or if this proves to be a significant way of reducing costs. A Taylor cast iron and steel "lowside" type bell frame during construction. 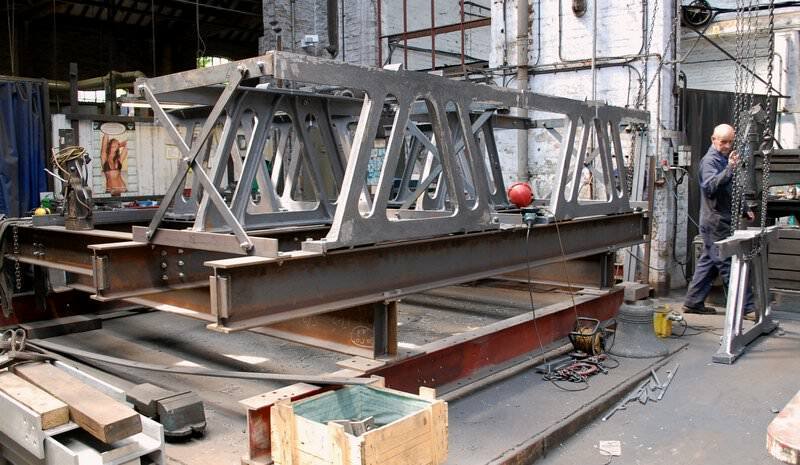 Massively strong - a Taylor cast iron and steel "H" type bell frame during construction. Hollow box section cast iron headstocks give excellent rigidity to weight ratios and have proved to be very durable. In special cases, if customers request it, we do supply headstocks made from galvanised steel or hardwood. Double row, self aligning bearings are fitted as standard. These are housed in our own cast iron bearing housings. These are completely crafted from hardwoods, using stainless steel screws when attaching the shrouding to prevent timber splitting. Profiled metal wheel strengthening irons are also supplied to ensure rigidity. 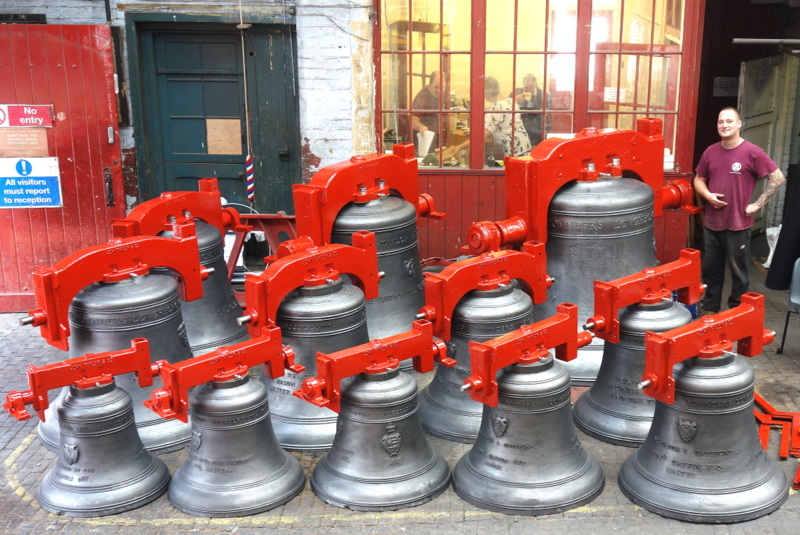 A new ring of ten bells ready for dispatch from Loughborough. 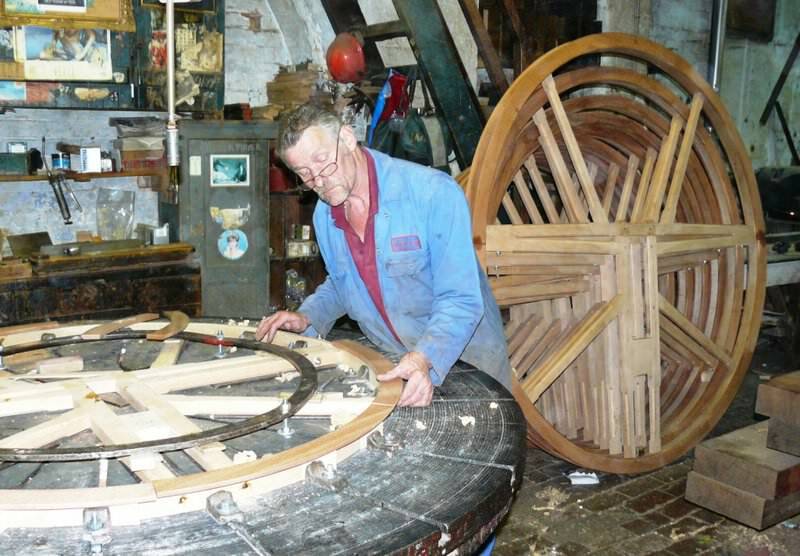 Our bell wheels are made from seasoned hardwoods in our wood shop. A set of reconditioned bell wheels after treatment with preservative in the Foundry dipping room. When appropriate old wheels are restored - here Bill prepares new wheel irons for a repaired wheel. Hardwood rope rollers from traditionally seasoned timbers, running on sealed ball bearings fixed to stainless steel joint pins are supplied as standard. These are manufactured from traditional hardwoods. Sliders are steam bent to ensure a long lifespan. Clappers are made from spheroidal graphite cast iron, and supplied with ‘Oilite’ clapper bushes with lubricant points. Composite clappers with either hardwood or nylon shafts are also supplied where appropriate or on request. Crown staples are made from cast iron and steel, and are supplied with castellated nut and split pin. 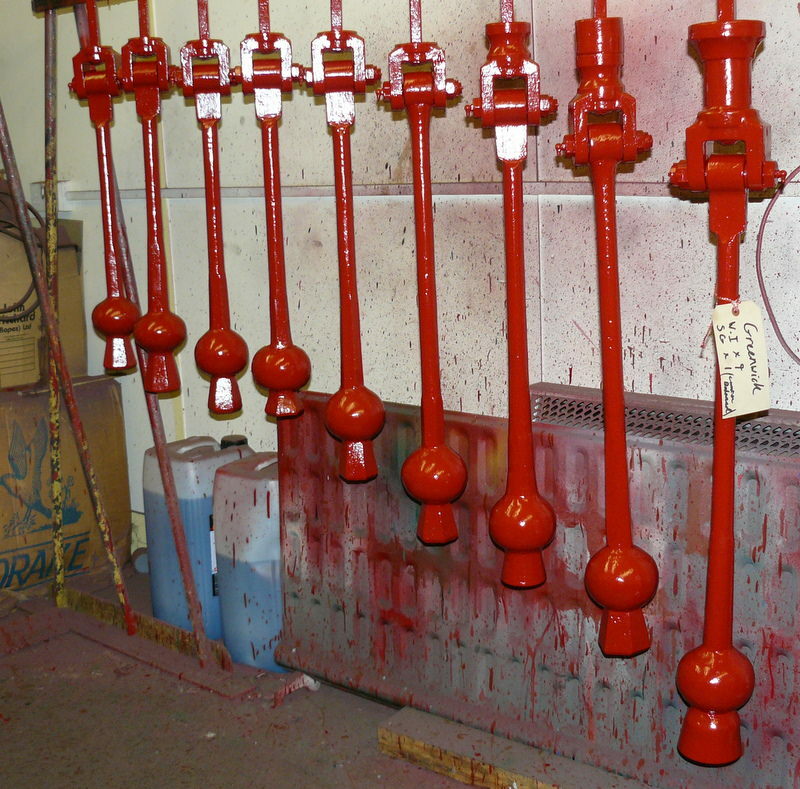 A set of clappers after repair and reconditioning at Loughborough. Testing a bell on the ringing-up stand before it leaves the foundry. Cast iron ceiling bosses are supplied as standard and are fitted to every floor the bell ropes pass through. These prevent rope wear and are almost silent as the ropes pass through them. Nylon bosses can be supplied for fitting on belfry floors where there is a lot of wetting. We manufacture our own bell ropes with traditional red, white and blue salleys. Other colour combinations are available when requested. Our bell ropes are supplied with pre-stretched polypropylene top ends as this gives the rope a longer lifespan and eliminates the problems of shrinkage in wet weather. 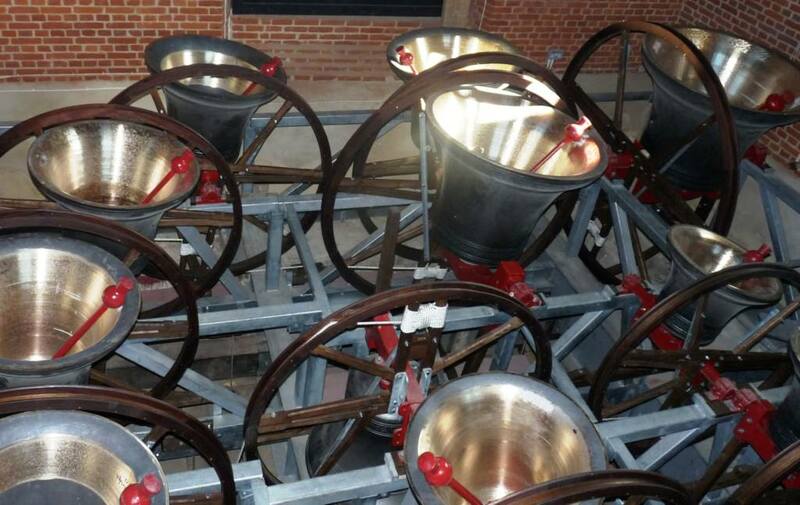 We manufacture and install these systems which allow all the bells in a ringing peal to be chimed by one person when a team of ringers is unavailable. We also restore these systems to full working order when requested to do so. 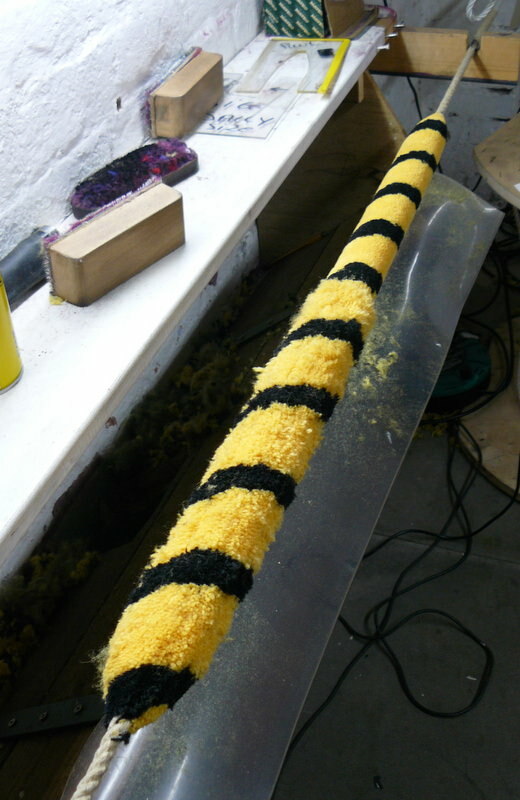 A new bellrope salley being shaved during the manufacturing process. A set of restored Ellacombe Chiming Hammers.